Und dann habe ich noch eine zweite Karte für Euch. An der habe ich mir ziemlich die Zähne ausgebissen, aber jetzt bin ich doch ganz zufrieden. Der Block von Pebbles ist aber auch zu schön! Mein Lieblingspapier im Moment, so sehr "Liebling", dass ich es kaum verbrauchen mag! Aber da haben wir uns wirklich wieder selbst übertroffen! Langsam sieht es eher so aus, dass eine vorbastelt und die andere sich inspirieren lässt! Auf jeden Fall ist deine Karte echt toll geworden! Mir gefallen die Wolken sehr! Und die quietschegelben Flieger sowieso! Aber noch besser gefällt mir deine zweite... soooo schön! Die Hervorhebung des einen Hauses, der Pfeil, die Herzchen - genial! Wieo hast du dir denn die Zähne ausgebissen? Both cards are FAB!!! Love the contrasting colors of the firstand the focal spot of the second. Great designs! 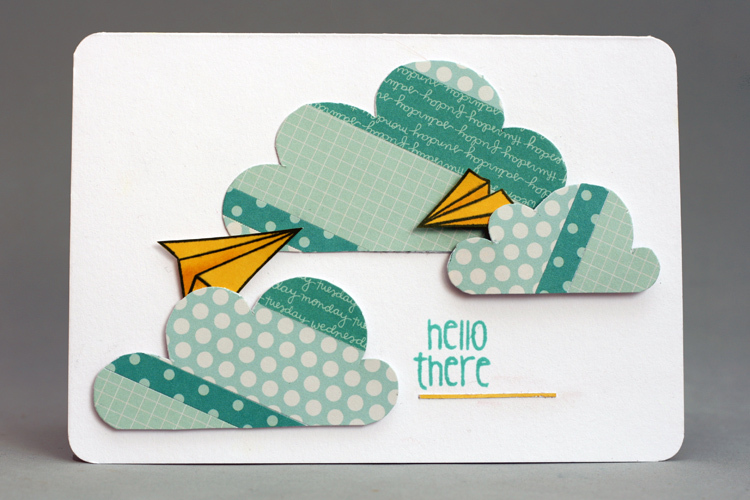 How fun are those patterned clouds and your spotlighting with the hearts is great! Sehr schöne Kärtchen hast Du gewerkelt. Es gibt soooo viele tolle Details auf den Karten zu entdecken.. einfach klasse! SUPER TOLLE Karten! Alle Beide!!! Sehr schön. Beide Karten sind absolute Hingucker! Mir gefällt vor allem die Technik der zweiten Karte. Das werd ich glatt auch mal probieren. 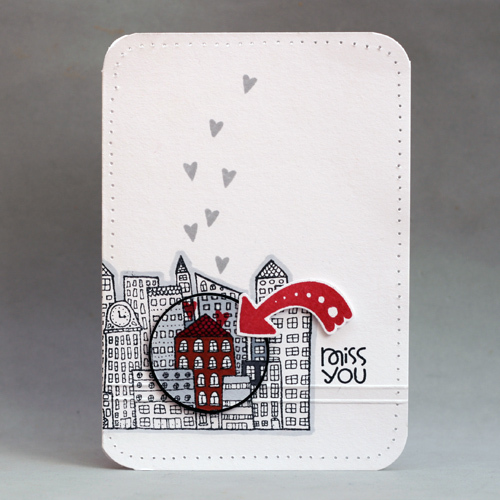 Clever use of that city stamp and the bold pop of red on the arrow is perfect! Thanks so much for playing along with this week's CAS(E) This Sketch! Innovative way of spotlighting. I LOVE it. Awesome card. Thanks for playing long with us @ CAS(E) this Sketch! LOVE LOVE LOVE! I love how you made the building pop from the city! REALLY cool. So glad you joined us at CAS(E) this Sketch! Absolutely love both your cards Christine but my fave has to be the spotlight house one. Just saw your card on the CAS(E) this Sketch blog...under the WINNER section!! Congratulations and VERY much deserved. BEAUTIFUL card!!! Love your Silly Scape card. Congrats on your win at CASE this sketch. That is how I found you. I love this stamp, and am always looking for new ideas for it. What a great design with the spoplighted building and the floating hearts! Oh how I love your cards! Cute clouds and the buildings are the cutest accent. Congrats Christine! A well deserved win! Took a lovely stroll through your blog - your work is amazing - love, love, love your clean & simple style! amazing!!!!! wow!!! i am in LOVE!